Hachette Audio, 2013. 4.5 hours on 4 CDs. “When Did You See Her Last?” is the second entry in the All the Wrong Questions series of crime noir for kids. Young Lemony Snicket continues to stay in Stain’d-by-the-Sea. He and his chaperone are asked to solve another mystery, and once again his chaperone is completely misled, but young Snicket follows a progression of clues and reveals answers. These books should be read in order. 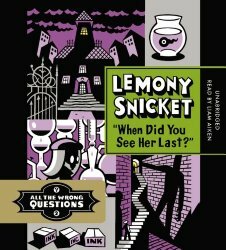 A master villain is hanging about, the statue from the previous book makes an appearance, and we get more clues as to what is going on with Lemony Snicket’s sister, but no answers. These make wonderful listening. You’ve got a gripping story with plenty to set you chuckling. This would be ideal for a family trip. Now I just hope the next installment is coming out soon! This entry was posted on Friday, May 2nd, 2014 at 10:30 pm and is filed under Audiobooks, Children's Fiction Review, Contemporary, Mystery, Suspense. You can follow any responses to this entry through the RSS 2.0 feed. You can leave a response, or trackback from your own site.